In this type, the part of the field winding is connected in parallel with armature and part in series with the armature. Both series and shunt field windings are mounted on the same poles. 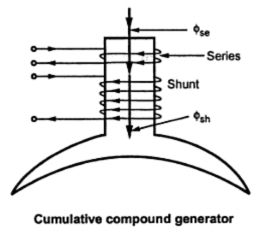 Depending upon the connection of shunt and series field winding, compound generator is further classified as : i) Long shunt compound generator, ii) Short shunt compound generator. 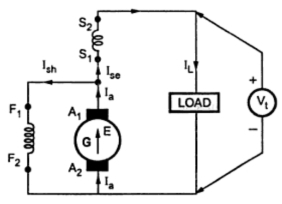 In this type, shunt field winding is connected across the series combination of armature and series field winding as shown in the Fig. 1. Voltage and current relations are as follows. Voltage across shunt field winding is Vt. 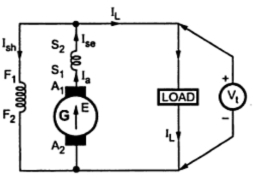 In this type, shunt field winding is connected, only across the armature, excluding series field winding as shown in the Fig. 2. The drop across shunt field winding is drop across the armature only and not the total Vt, in this case. So drop across shunt field winding is E -Ia Ra . Any of the two above expression of Ish can be used, depending on the quantities known while solving the problems. It is mentioned earlier that the two windings, shunt and series field are wound on the same pole. Depending on the direction of winding on the pole, two fluxes produced by shunt and series field may help or may oppose each other. This facts decides whether generator is cumulative or differential compound. If the two fluxes help each other as shown in Fig. 3 the generator is called cumulative compound generator. 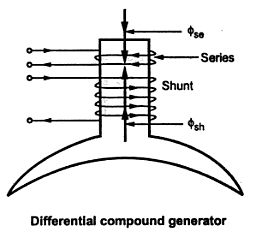 If the two windings are wound in such a direction that the fluxes produced by them oppose each other then the generator is called differential compound generator. This is shown in the Fig. 4. Where Φsh = Flux produced by shunt field winding. Φse = Flux produced by series field winding.